Are Inversion Tables Effective for Back Pain? Note: This blog was written by one of our physical therapy students on rotation with us as part of his training. Thank you to KU Med physical therapy student Tanner Vinson for this informative blog. We get asked a lot about inversion tables around here. It’s a good topic to talk about! Back pain is one of the more common conditions we see here at SSOR and it affects people of all ages and activity levels. A global review of the prevalence of low back pain in the adult general population has shown its point prevalence to be approximately 12%, with a one-month prevalence of 23%, a one-year prevalence of 38%, and a lifetime prevalence of approximately 40% (Manchikanti et al, Neuromodulation 2014). Furthermore, as the population ages over the coming decades, the number of individuals with low back pain is likely to increase substantially. Arguably, no other condition has as many treatment options that have been proposed over the years. Medications, chiropractic, holistic care, yoga, pilates, and at the most extreme, surgery. One other intervention that is rather ubiquitous is inversion tables. 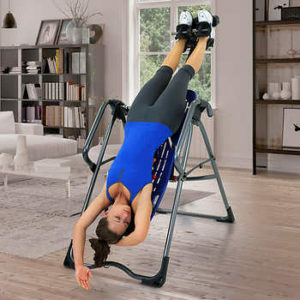 Inversion tables are available for purchase and have even been the subject of late-night infomercials. Do inversion tables work though? Inverting the body to treat physical ailments was first seen being used by Hippocrates, the father of medicine. He theorized that inverting the body would reverse the compressive force effects of gravity. It was not until the 1960s that gravity-facilitated traction was made relevant again by Dr. Richard Martin and (as some of you may remember) again in the early 1980s when Richard Gere was featured using Gravity Boots in “American Gigolo.” Around this time in the 80s, inversion traction devices saw a dramatic increase in demand and have since been the topic of debate in terms of their effectiveness to treat lower back pain and associated symptoms. Nonetheless, these devices have remained relevant for all this time and are still being sold by many retailers today. Conventionally, traction in the horizontal (gravity-eliminated) position is being practiced to help treat back pain by many physical therapists. Traction by inversion is advantageous because it does not require another person to administer treatment. On the contrary, conventional traction has the advantage of being administered by a professional that may help in determining the need for traction or what parameters to adhere to. The research comparing conventional traction to gravity-facilitated traction suggests both have positive effects, but one is not superior to the other. Therefore, we may draw some conclusions from the research of conventional traction techniques in regard to inversion tables. What’s the Evidence on Conventional Traction? Conventional traction alone has NEVER been proven to be effective long term for treating back pain. There is evidence that traction as PART OF a rehabilitation program may help improve quality of life and reduce radiating symptoms (symptoms into the gluteals, legs, or feet) associated with lower back pathology. The research suggests that the effects of traction are relevant in THE SHORT TERM (less than 6 weeks). What is the Evidence for Inversion Tables? 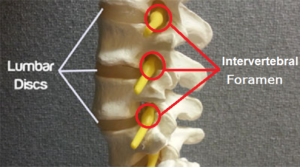 It has been proven that the pressure within the discs decreases and the intraforaminal space (where nerves exit the spine) increases with gravity-facilitated traction. Several studies show decreases in muscle activity of the lumbar spine when using inverted traction. This is relevant in cases involving back spasms. 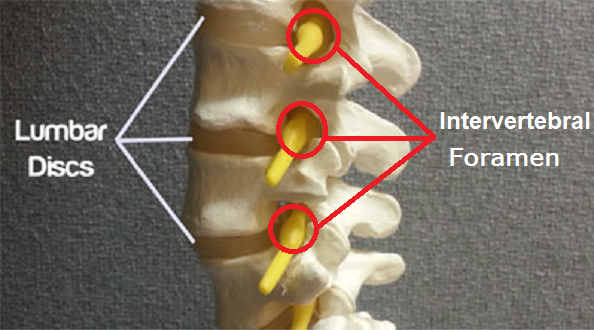 There are studies that look at the effect gravity-facilitated traction has on single level herniated discs. In these studies, patients using inversion traction were able to return to work or avoid surgery based off of a reduction in painful symptoms. The current body of research has failed to fully explore the effects of inversion traction. For starters, these studies are small meaning there is a small sample size to draw conclusions from. Secondly, these study designs fail to compare parameters and their effect on outcomes. Some of these parameters lacking in research include duration, frequency, and angle at which to invert for maximum benefit. In terms of outcomes, the research fails to examine long term results of using inversion tables. Lumbar traction of any kind has been shown to be effective in reducing short term symptoms associated with lower back pain by creating space between the vertebral joints. Like with any weightbearing joint of the body, muscle imbalances (faulted posture) will result in excessive forces to the vertebral joints that result in degeneration over time. The degeneration of discs can result in disc bulging and narrowing of foramen (hole for nerves exiting the spine) which both may result in radiating symptoms. These symptoms are the symptoms that traction (as well as inversion traction) seems to alleviate. The joints within the spine are responsible for absorbing and transferring compressive forces. Faulted postures plus compressive forces combined for long periods of time cause the discs to deform, resulting in bulging and degeneration. Traction reduces compressive forces which has been proven to reduce symptoms. The elimination of compressive forces (traction) results in short term results. Given the equation for disc pathology, posture must be addressed to achieve long term results. If you have not experienced back pain before, it might be best to get a professional opinion first. In Kansas, you can see a physical therapist without a physician referral, so let one of our staff take a peek at you. If it’s anything serious, we’ll direct you to the right provider. All that said, if you want to try inversion tables, keep in mind that individuals with conditions that are affected by increases in blood pressure or intracranial pressure as well as mechanical stresses of joints should seek a professional opinion first. Some of these common conditions include hypertension, glaucoma, and osteoporosis. If you have an inversion table or know someone that does and you choose to use it, it is likely that you do not need to be fully inverted. This means that you do not need to be completely upside down. Most angles in research are between 30-60 degrees from horizontal. This will help minimize increases in intracranial pressure and increase tolerance to inversion. Although the parameters are not well defined in research, it’s a safe rule of thumb to perform inversion traction for short bouts (less than five minutes) a couple of times. While inversion tables may help with pain and symptoms, they are not a long-term solution for low back pain. The only long-term solution for low back pain is exercise, postural improvements (standing desks versus sitting all day, for example), and practicing good body mechanics/ergonomics. If you need some direction, it would be a privilege to serve you and partner with you in your care. Give us a call!